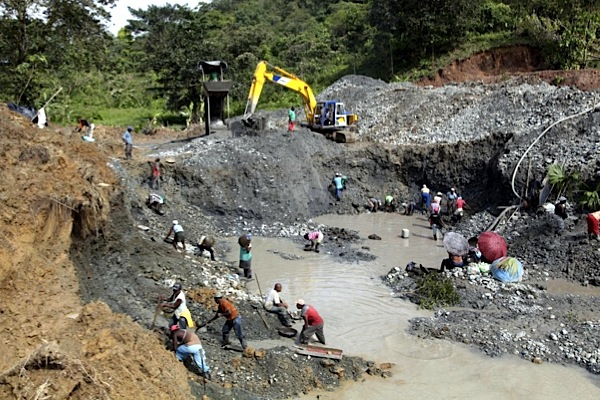 A sudden boom in illegal gold mining in Colombia is fuelling human trafficking and forced labour in and around mines loosely connected to paramilitary groups, drug traffickers and leftist guerrillas, according to Aljazeera. In an in-depth report, the news outlet reveals that small-scale miners are being forced out at gunpoint or extorted to work for the armed groups that are taking over their operations. Residents are caught in the crossfire. About 200,000 Colombians were driven from their homes in 2013, the latest year for which data is available, according to Consultoría para los Derechos Humanos y el Desplazamiento, a Colombia-based human-rights group. The government estimates that about 80% of all the gold produced in Colombia comes from informal operations, many considered illegal, which is creating a parallel economy that is deemed to harm the business of those who operate legally. The sector is estimated to bring in approximately $2.5 billion a year and has now eclipsed cocaine trafficking as the main driver of violence and a source of dirty money. Despite the government’s aims to formalize all miners by 2032, a recent investigative report financed with a grant from NACLA’s Samuel Chavkin Investigative Journalism Fund, shows that so far the program has been marked by extremely slow progress, chaos, and inconsistencies.